The Gadget: A handheld internet browsing device that functions using a GPRS data connection, freeing you from the confines of limited Wi-Fi coverage. The Pocketsurfer 2 incorporates a specialized compression technology that does away with the typical slow speeds associated with GPRS. Datawind did great work in implementing an accelerated form of GPRS, but the gadget itself left us longing for V3.0. The Build: Physically, the Pocketsurfer 2 is not really an internet surfer for the pocket; the dimensions of 152 x 75 x 15 mm, mean it is quite far off being comfortably pocket worthy. The 640 x 240 VGA screen is abysmal; it reduces high-resolution images to nasty grainy spaces of general distortion. On a plus note, it has a full QWERTY keyboard that is rather fantastic. It takes some getting used to if you are not familiar with RAZR-type keypads, but once you are about and clicking, it works extremely well...it works extremely well as long as you cannot hear it. The backlight kicks up the most ridiculous buzzing racket, the likes of which I have not heard emanate from a portable electronic device since the cassette Walkman was commonplace. You will not notice it when you are in the urban jungle, but at home, I kid you not, it shall give you a very real headache. Getting Around: The navigation controls are a disaster; there is no scroll wheel, so you must rely on a four-way direction pad to get you around webpages. 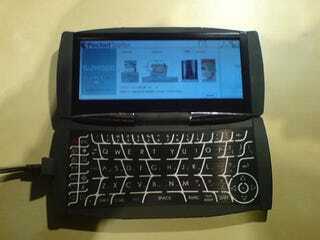 On a mobile phone with a 2.5" screen, a four-way direction pad just about makes web surfing possible. On a device with a 5.2" widescreen, that simply is not feasible. Generally, the Pocketsurfer 2 has a solid construction; it's weighty in a good-to-hold kind of way. However, the attention to detail is poor; the chromed plastic pieces are rough and the port coverings are shabby rubber plugs that do not fit properly. The styling of the unit is not so bad, and the poor quality is only noticeable once the gadget is thoroughly inspected. So how does it weigh up for browsing the old internet? Functionality: Datawind's product runs their very own software, tip to toe, and though the compression system, which promises to load webpages in seven seconds flat sometimes delivers, it is far from consistent. Simply put, everything about the Pocketsurfer 2 is buggy as hell. The start up time is lengthy (approx 35s), when it works. On many occasions it refuses to connect. Indeed, during a private display of the device by Datawind's CEO, a failed connection occurred—in the center of London, I very much doubt that absent cellular network coverage was the cause of the mishap. It was not an isolated incident either; during my testing, time after time a connection would be reset, time out or return with a server error. When you are out and about and want to quickly check your email, the service simply does not cut it. Neither does the sub 5-hour battery. When it does work, the compression/caching of information is impressively fast for a GPRS connection. The browser itself lacks any form of video codec compatibility, and as mentioned before, the screen will barely display high-resolution images. Even if it did, there is no way to zoom out and get the whole picture, so unless you like your picture viewing in clickity-click parts, this does not really solve the great mystery of succinct mobile web browsing. In the gadget's defense, Google maps seem to work well on the few occasions it loads up without fault, thanks to proper pseudo-GPS information. Also worth noting is the optimized mobile Zoho suite, which could be useful if the text entry delay was not so severe. Unfortunately, the time elapse between a key press and that key taking effect is ridiculously long. The Price: The UK will see the Pocketsurfer 2 available for £179.98 ($363), with 20hours of web surfing/month included in the asking price. You guys Stateside will have a much steeper deal; the product will be made available via T-Mobile for $29.99 per month (unlimited data plan), on a 12 month contract. The hardware will be an additional $299. The Verdict: I really tried to love the Pocketsurfer 2, I promise you; I opened my cold, black heart to it and it failed me. I do not want this to read as a blank slating of a company's endeavours, but the void this product fills is sadly non-existent. It has no raw power to natively run apps. It relies entirely on a GPRS connection that is temperamental at best. It has no means of effective navigation. In three words: it doesn't work. The notion of entire back end server reliance for hardware is very much the vision of the future, but the Pocketsurfer 2 is a little ahead of its time in terms of the idea at work. Sadly, it is a little behind in terms of technology implemented. A GPRS connection is never going to be a viable means for mass data transmission; no matter how good the caching system may be. The technology used is simply too out dated (for this purpose) to be functional.